I was raised to keep my room cleaned and organized. I can still hear my parents saying, "pick up your towel" and "what, were you born in a barn?" I may not be perfect, but those words have always taught me to pick up after myself and to return items to the place they belong. I have done my best to take these same practices anywhere I go, including the gym. It's never too late to learn Gym Etiquette. As I walk through the gym I see used towels sitting on the floor, left on benches, or sitting in the showers. As a simple reminder, all towels should be placed in the towel bins located on the fitness floor and in the locker rooms. Leaving used towels in various places is not the only problem we are faced with at the gym when it comes to gym etiquette. 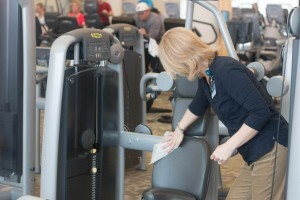 We've all seen members walk away from equipment without wiping it down. Many of us have seen another member walking on a treadmill while talking on their cell phone. If you're a class goer you've seen members trying to save spots for their friends in group fitness classes. Gym etiquette rules are broken quite frequently. Maybe we just needed that simple reminder; I know I sure need reminders from time to time. 1. Wipe down equipment after use. 2. Put towels in the bins after using them. 3. Limit cardio equipment usage to 30 minutes. 4. Do not save spots in a class. 5. Limit phone calls to the lobby level or cafe'. If you need to answer your phone, please limit the length of the call and keep the volume down. Remember, in order to maintain privacy for all members, no cell phone use allowed in locker rooms. 6. If you use a piece of equipment, please return it to the correct location. 7. Let others use weight machines between sets (after wiping them down of course).